During my recent journey home for winter break, I encountered advertisements for both City Year and Teach For America. I currently work with City Year and I had worked with TFA last year. On the public bus from my apartment to the airport, there was a City Year ad similar to this one (different person and tweet, but same idea). At the airport, in the bottom of the bins people put their stuff in while going through security, this is the TFA ad. The words say, “What do our nation’s leaders look like?” with a “YOU” inside the silhouette and a TFA logo at the bottom. Full disclosure: I actually took this picture of the airport bin on my way out of town for Thanksgiving, but the ads were still there when I went through the airport again last week. Certainly, this is a very small sample of all of the advertising these two organizations do nationally. However, I was struck by the fact that City Year was advertising on a public bus, while TFA was advertising in an airport. I don’t have any data in front of me, but I think it is fair to assume that the demographics of air-travelers differ pretty significantly from the demographics of city bus riders. I wonder about the degree to which the recruitment strategies of these two organizations purposely focus on these particular demographics. I think is also interesting to note that the City Year ad (more so than the TFA ad) is not just about recruitment, but also builds wider awareness of the organization’s work–and support for that work–which I think City Year does a SUBSTANTIALLY better job of than TFA. Having worked within both, the community support of City Year is dramatically more actively positive than it is for TFA. By “community support,” I mean the support of teachers and administrators in the schools, parents/students/etc., local companies and foundations, local media, and local elected officials. Ads like this play an important role in simply increasing community awareness of City Year. That being said, some of my City Year colleagues are sometimes concerned about the extreme degree to which City Year focuses on its branding and on attracting (positive) attention to itself at the expense of spending time on actually supporting kids–a position I sometimes do agree with. However, in the long run, I do think much of this stuff–the bus ad included–probably does increase our image in the community to such an extent that it is possible to serve more students more effectively by getting new sponsorships, approval to expand to additional schools, etc. 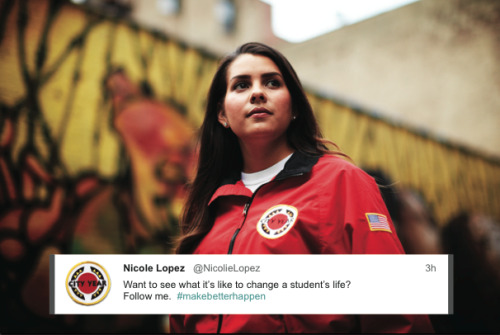 While the City Year ad tries to recruit people while also building recognition and support in the community, the TFA ad may actually have a secondary purpose beyond just recruitment, as well. Maybe TFA thinks that being able to pay attention to the ad deeply enough to follow up later means that the person handles stress exceptionally well and can still think about the big picture while in a stressful situation. Certainly, I have no way of knowing if any of this actually matches the thinking of the marketing people in both organizations, but I certainly do find it interesting to compare these small signals about the organizations’ deeper philosophies. I am curious to hear if you notice any other interesting comparisons between these ads (or other TFA or CY ads)…. This entry was posted in CIty Year, Personal Experiences, TFA and tagged ad, airport security, City Year, marketing, PR, stress, Teach For America, TFA. Bookmark the permalink.